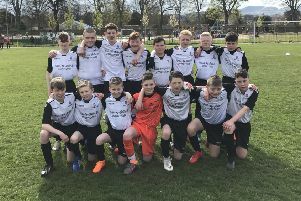 Scott Maxwell reckons Spartans are finally beginning to show the type of form that made them champions last term after they ended Kelty Hearts’ slim title hopes on Friday night. The Ainslie Park outfit maintained their unbeaten record over the former Junior giants with a 2-1 victory and ensured boss Dougie Samuel’s blemish-free record over opposite number Barry Ferguson remained intact. Spartans enjoyed the upper hand during the first half with Jack Smith shaving the wrong side of the post in the opening stages after Gary Cennerazzo’s rampaging run forward. Kelty goalkeeper Scott Christie then pulled off a double save to deny Blair Atkinson before the visitors broke the deadlock against the run of play five minutes into the second half. A powerful effort from ex-Spartans man Errol Douglas flew into the bottom corner of the goal, but the lead lasted just five minutes. Former East Stirlingshire and Berwick midfielder Maxwell linked up well with Jack Smith to convert his third goal of the season. The match-winner arrived after 79 minutes. Aaron Scott lifted the ball over to Atkinson to spark a counter-attack, and the youngster displayed clever footwork to cut inside on his left and dispatch a right-foot shot beyond the keeper’s reach into the far corner. “I think we deserved to win the game and that was our fourth win on the bounce,” stated 28-year-old Maxwell. “Hopefully we can keep it going and finish the season with our unbeaten run still intact. We are playing some good football just now and haven’t been conceding many goals. “We’re dominating most games we’ve been in recently and have been taking our chances when they’ve fallen our way, which didn’t happen often enough during the first half of the season. “It’s a very good record to have against a team like Kelty because they’re a strong side with some quality players. They can’t win the title now, so it’s East Kilbride’s to lose. “I don’t score that many, but it was pleasing to finish this one off, I’ve struck it well with my right foot. If I can add a few more goals to my game and keep myself free of any injuries, then I’ll be delighted. Civil Service Strollers recorded their first ever league win over Stirling University after midfielder Iain Ballantyne drilled home the only goal of the contest at Christie Gillies Park. Gary Jardine’s side remain in the hunt for a top-four finish after capitalising on Stirling’s poor decision making in the final third, with Ballantyne’s driven low effort through a cluster of bodies nestling in the bottom corner. Max Condie’s second goal in three games since returning from injury wasn’t enough as Edinburgh University were held to a 1-1 draw by Cumbernauld Colts at Broadwood Stadium. Dorian Ogunro’s Students had taken a 35th minute lead through defender Condie but Colts equalised midway through the second half. Ex-Aberdeen youth Stephen O’Neill latched on to Fraser Team’s through ball and rounded the keeper to slot into an empty net. Basement boys Whitehill Welfare were denied the opportunity to close the gap on idle Dalbeattie Star as their trip to Gretna 2008 was called off after the Raydale Park pitch failed a morning inspection.